Most people live their lives as a complete strangers to themselves. All in the name of trying to impress, fear of rejection, want to be heard and the rest of them. Don't let that happen to you. I believe YOU and I are supposed to stand out and not blend in. But ye are a chosen generation, a royal priesthood, a holy nation, a peculiar people. The most exhausting and frustrating thing in life is to live and trying to be someone else. Recently I heard a rumour about someone impersonating the president of my country which some people claimed he has died. So I ask myself, if this is really true, this imposter is going to live the rest of his life as the claimed deceased president as long as his tenure have not expired. Imitating someone you barely know, isn't that exhausting and frustrating? No matter the amount you're gonna be paid. Dare to be what you're created to be. Think about it. Aren't the most discontented people you know trying to be something they are not or trying to do something they are not supposed to do? Resolve to be yourself. The easiest thing to be in the world is YOU. The most difficult thing to be is what other people want you to be. 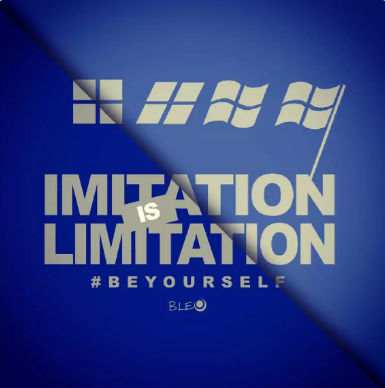 Imitation is Limitation and the opposite of courage is not fear, its conformity. My mother said to me if you become a soldier you'll become a General, if you become a monk you will end up as the Pope. Instead I became a painter and wound up as Picasso. There's no great man or woman throughimitation. DON'T BE A COPY OF SOMETHING. BE AN ORIGINAL AND MAKE YOUR OWN IMPRESSION. @tpot, sorry to see you have less Steem Power.